Here's a question that popped up on one of the GP forums the other day. 'Is it possible to automatically put a customer on SOP process hold if an order exceeds their credit limit?'. The answer is yes and here's how you do it. 1. Setup a Credit Process Hold disallowing transfer or posting of the order document. Well, everyday I learn something new. My friend and fellow MVP Victoria Yudin had been wondering what could be the possible values stored in the PSTGSTUS ('Posting Status') column of the tables dbo.SOP10100 (technical name: SOP_HDR_WORK) and dbo.SOP30200 (technical name: SOP_HDR_HIST) statuses as a result of a posting operation in Sales Order Processing. In fact, just recently on the Dynamics GP Newsgroup, someone reported seing a status 508 in the SOP30200 table. The complete list was provided by a Microsoft support engineer on the Partners forum -- take note as they are not documented in the SDK. Lets assume that batch contains orders 'Ship Today' that need to be invoiced, this is, transferred. I have a client that ships thousands of pounds of products and equipment to customers, often filling small "consolidator" warehouses with the goods. Because of the size and weight of the products, most orders required them to get a shipping estimate from a freight provider prior to finalizing the order. 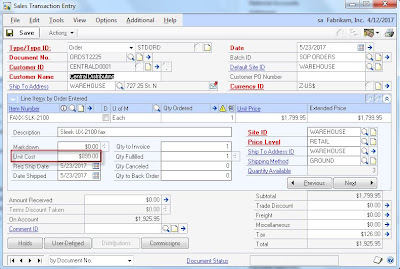 Dynamics GP doesn't display the total weight of an order during order entry, so the client asked me to create a custom field that would calculate the order weight and display it on the Sales Transaction Entry window. Some organizations would not just want to use Dynamics GP for their Financial Reporting purposes. They would also want the Dynamics GP to meet their Operational Reporting needs. Among those Operational reporting needs is the most important chunk, Supply Chain Management (SCM). Dynamics GP offers several reporting features to accomplish these needs. One such feature is Smartlist. I’d discuss several SCM metrics in my upcoming posts and I’ll discuss about Back Orders in this post. 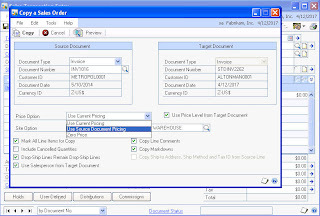 The following example shows how easy it is to use VBA to add a line number to a SOP Document. Need to prevent the display of Unit Cost in the Sales Transaction Entry window? If your company is a heavy user of Sales Order Processing (SOP) and has Customers that place repeat orders which list their Item Numbers and not yours, GP provides a simple, easy to setup, and efficient method to speed up the order entry process – Customer Items. 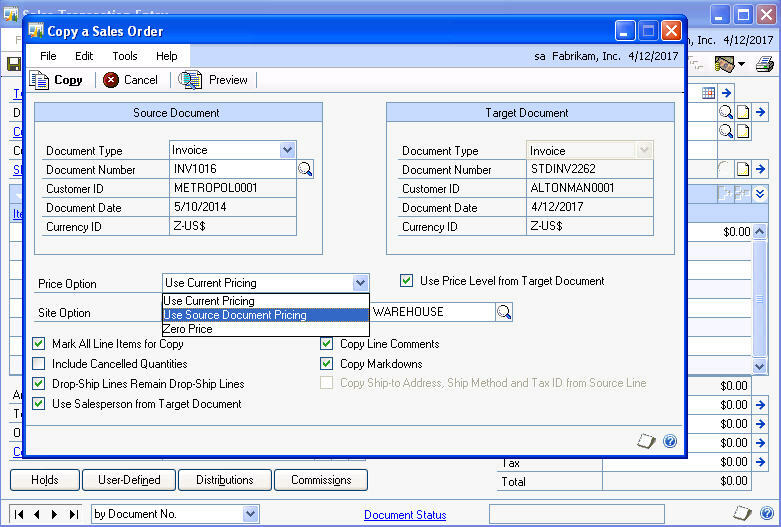 Have you ever seen the following message when entering an Invoice or Sales Order document? What is it, why does it appear, and how do you get rid of it? A sales order entry clerk has been instructed to change all requested ship dates on a 100-line item sales order. This sales order is also linked to a purchase order for the 100 line items. However, the clerk has discovered that Dynamics GP will not allow these changes to take effect by changing only the Requested Ship Date on the transaction header and must go into each line item to accomodate the for the new request. In addition, the clerk must communicate to the company's buyer that all line items on the PO must be changed to meet the new Required Date. It would be much easier sometimes if certain Dynamics GP functionality was available out-of-the-box. However, that would leave a lot of us without a job :-).